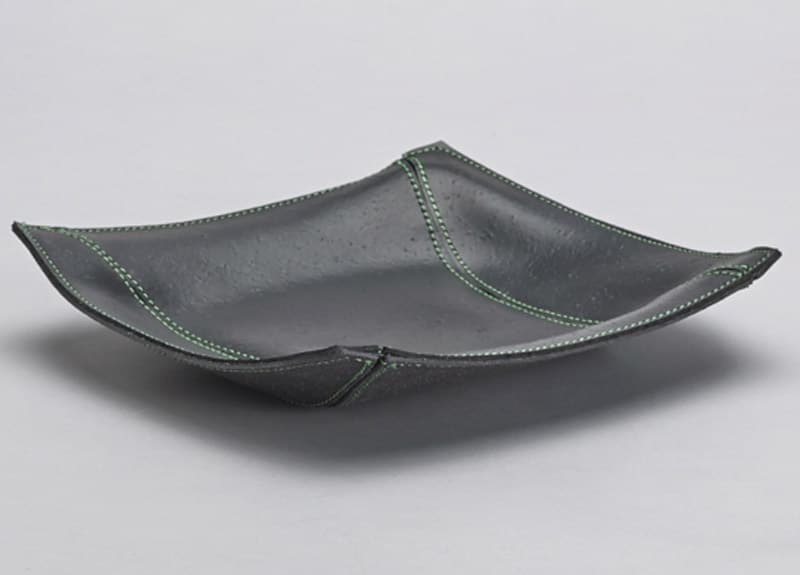 An unusual secondary raw material that is strong and soft at the same time, recycled inner tubes are available in large quantities, as they come from all vehicles on our roads, from bikes to tractors. 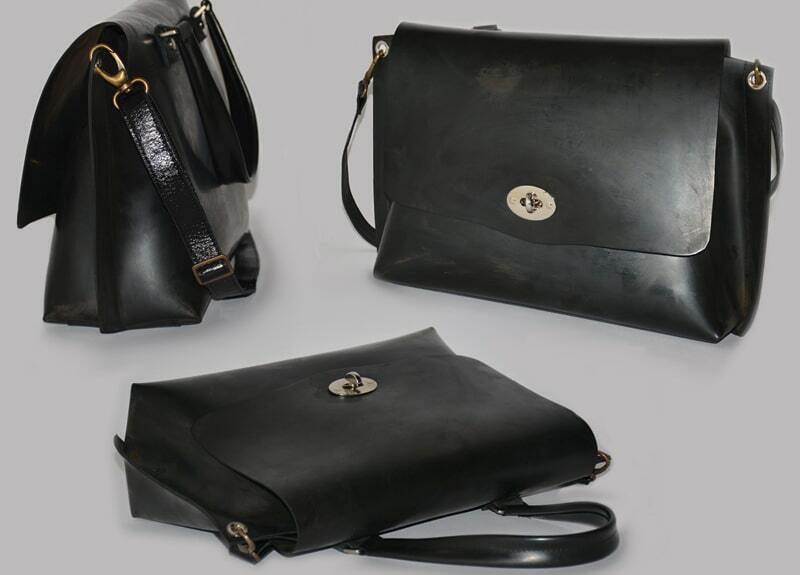 A very versatile material that can be used as a leather replacement in many cases. It is light and as such can be sewn by hand or machine, like a fabric. 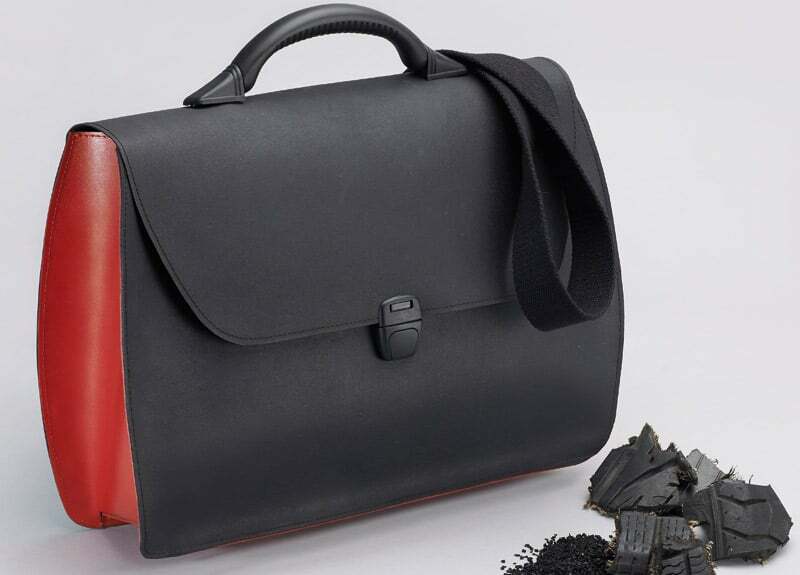 The Postina resumes the original model of postmen bag. 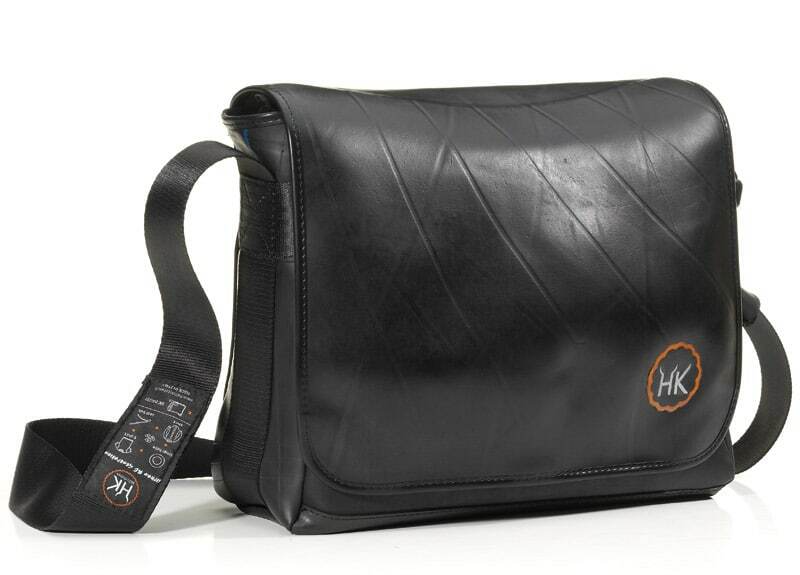 Made of recycled tires, it is equipped with an adjustable black thin cotton belt. Size: 44x26x13,5 cm (17,32×10,23×5,31 in). 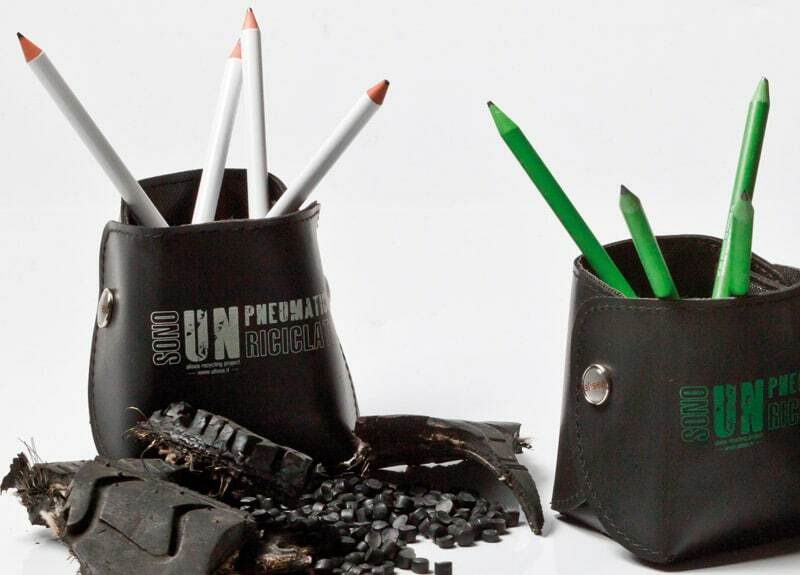 Made from recycled end-of-life tires (ELTs). Customized using silk screen printing. MEDIUM 32×34 cm (12.6×13.39 in). SMALL 16×11.5 cm (6.3×4.53 in). Plastic handle and cotton shoulder strap. 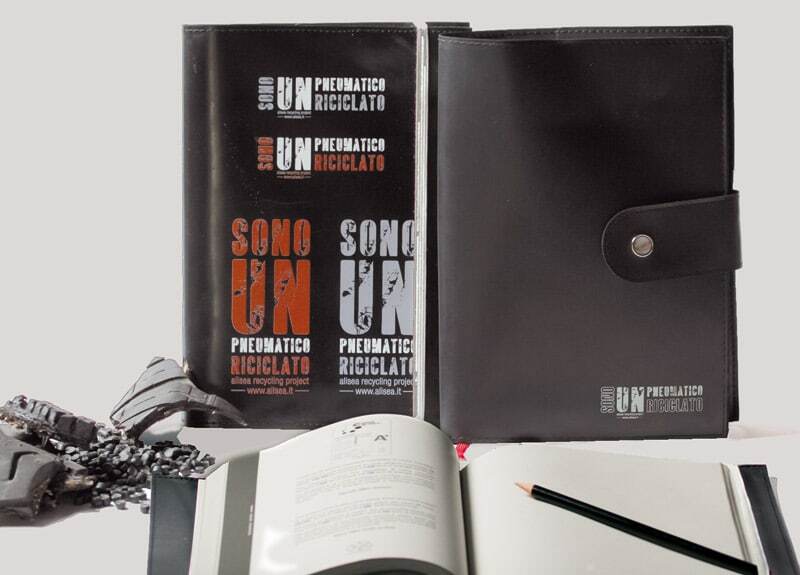 The front and back of the briefcase is made of recycled rubber. 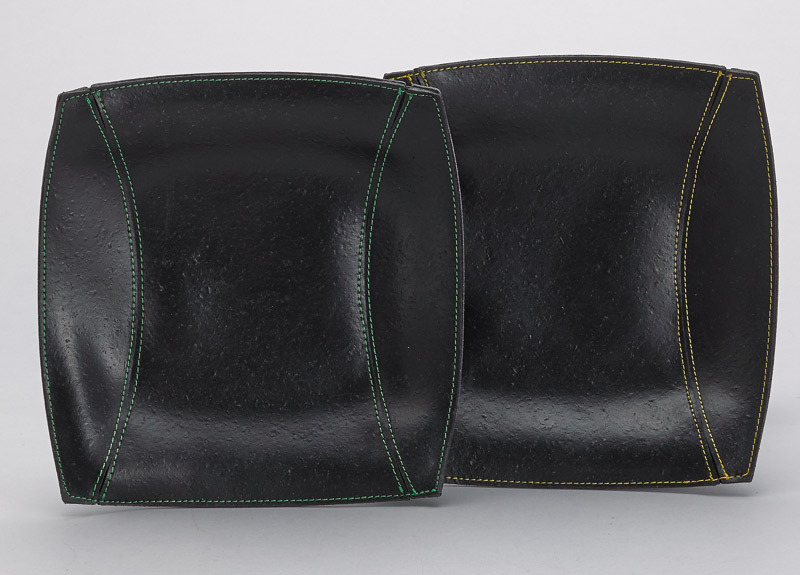 The sides are made from recycled leather. Can hold A4 sheets and has a pen holder. It is designed to be attached to vertical metal surfaces. Seams sewn using cotton thread. Logo of the “I’M A RECYCLED TIRE” collection. 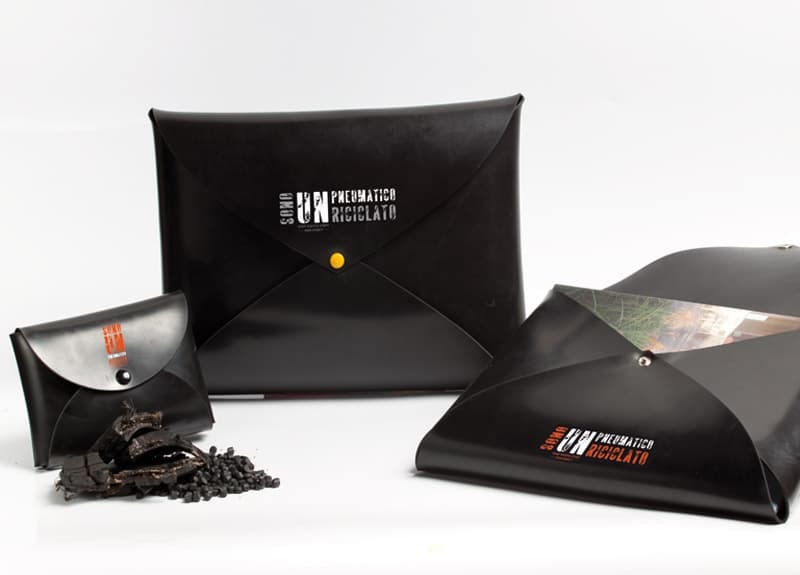 From end-of-life tires to reusable granules. 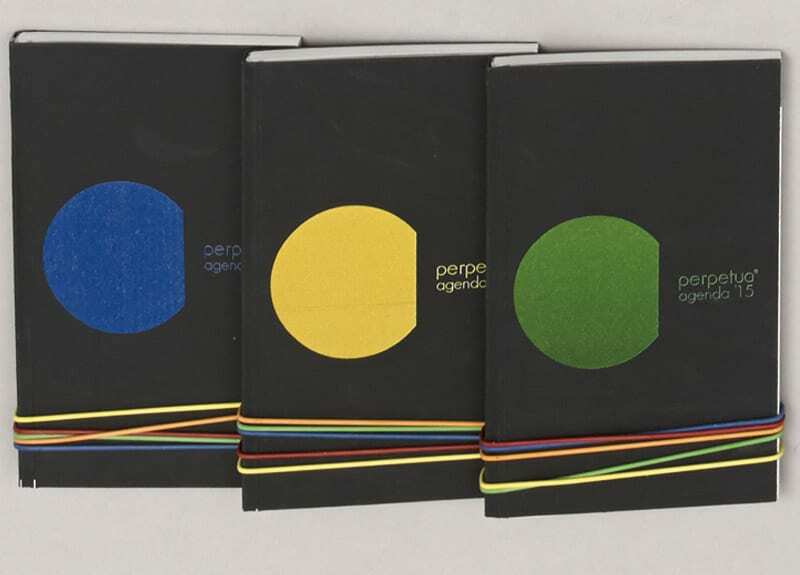 The cover for agendas/notebooks is stitched using cotton thread. Snap button or elastic fastener. 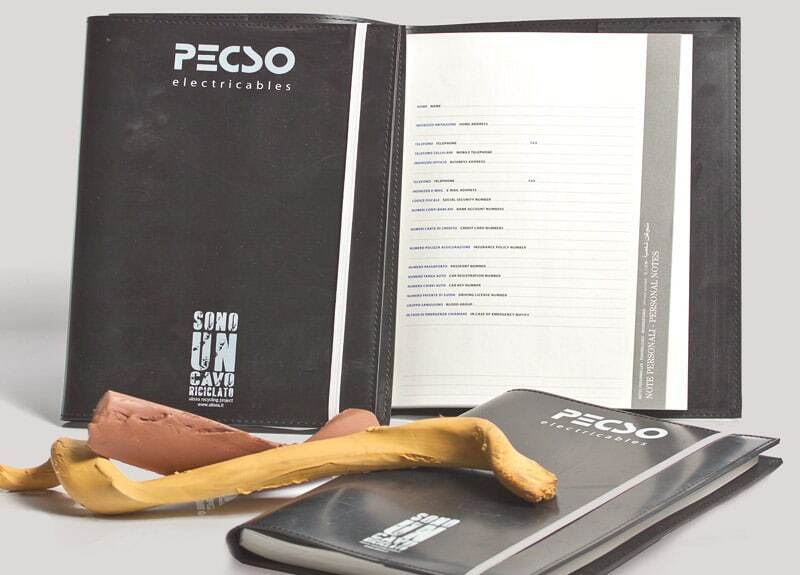 The cover was created using the rubber from recycled electricity cables. 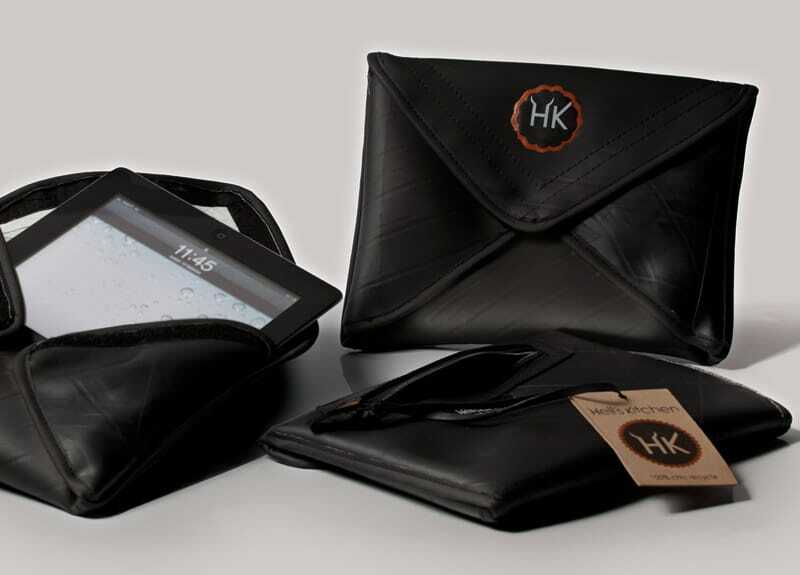 Inner pockets for business cards and USB flash drives. 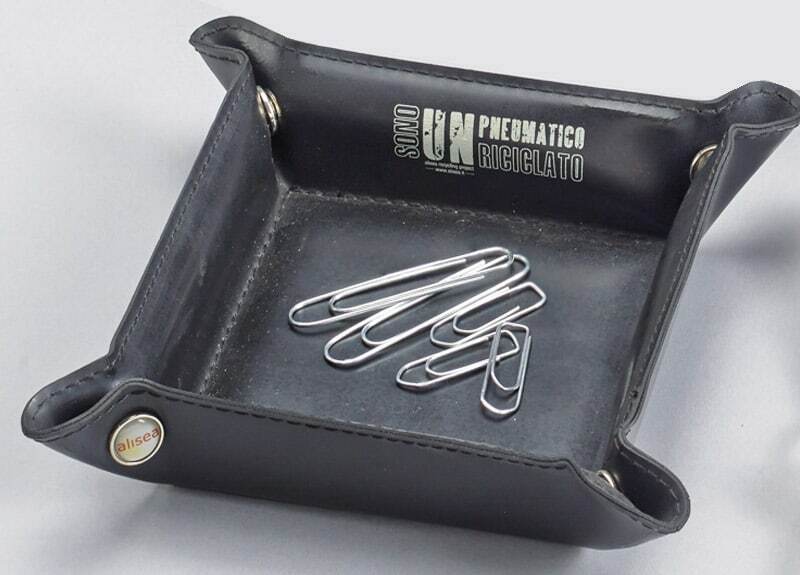 Useful for holding small items at home or in the office. 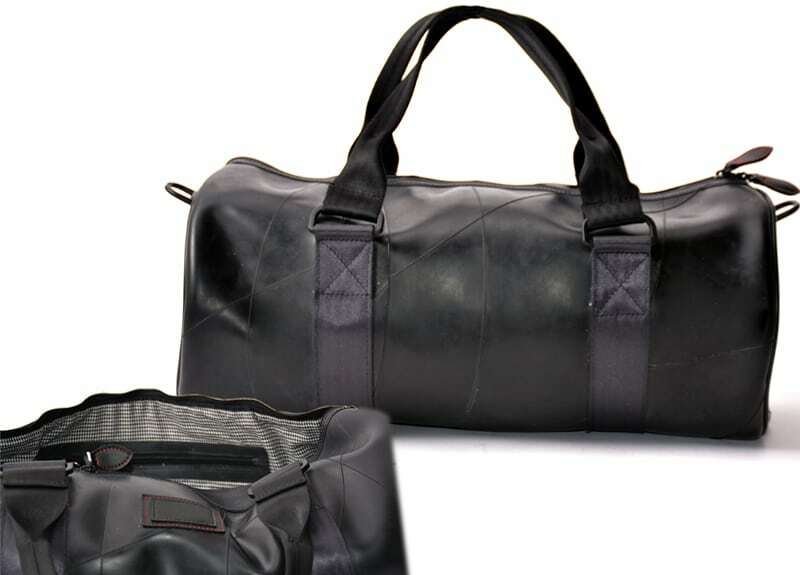 Made entirely from recycled end-of-life tires (ELTs). Cotton stitching available in various colors. Sizes: 20×20 cm (7.87×7.87 in), 30×30 cm (11.81×11.81 in). Detail of cotton stitching in contrasting colors. Detail of the cotton stitching. 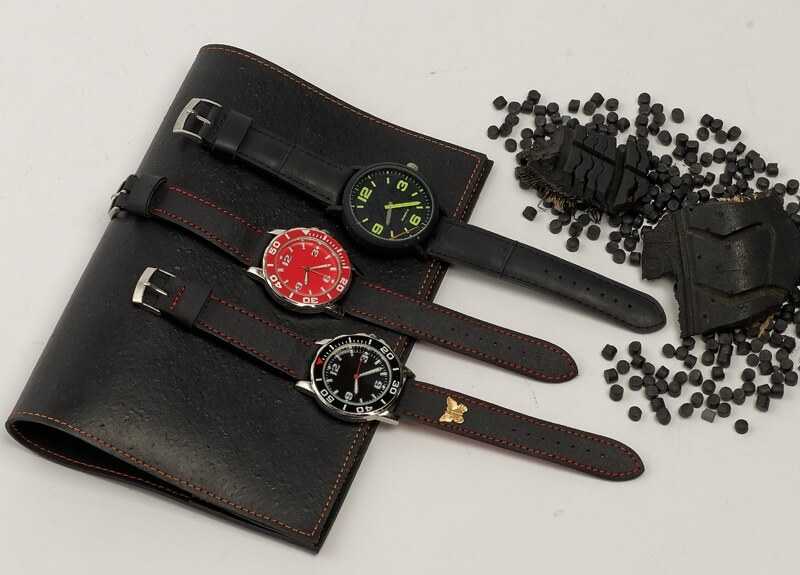 Available in different versions, the watches come with a single strap, made through the use of recycled rubber derived 90% from the recovery and recycling of used tires for cars bikes or motorcycles. Alternatively, with the recovery and reuse of inner tubes. 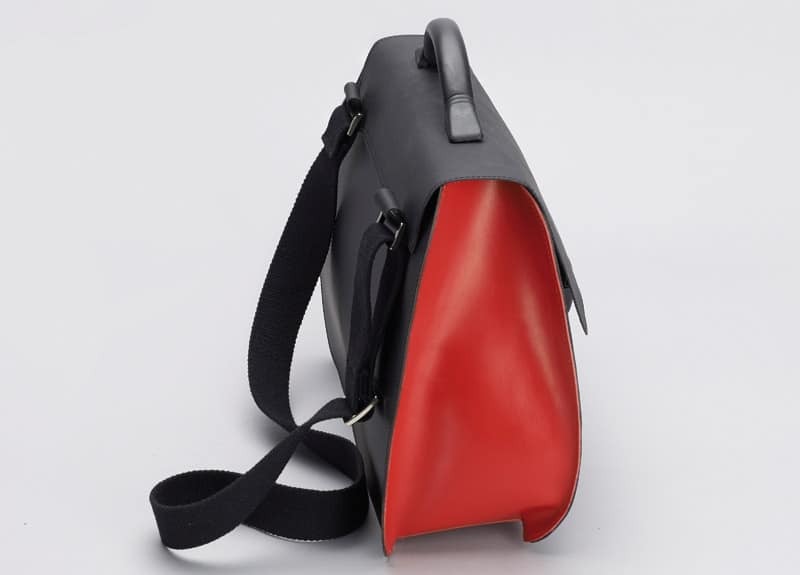 The internal part of the strap is made using colored leather scrap from the processing of a primary Brand of leathers. Pirelli adopted the “Zero Waste to Landfill” philosophy and is committed to promote alternative and innovative uses of End-of-Life Tyres (ELT). 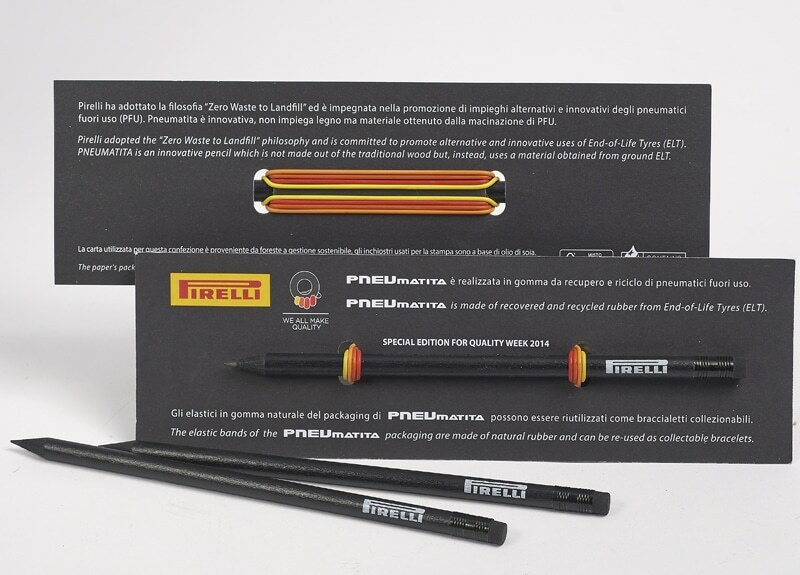 PNEUmatita is an innovative pencil which is not made out of the traditional wood but, instead, uses material obtained from ground ELT. 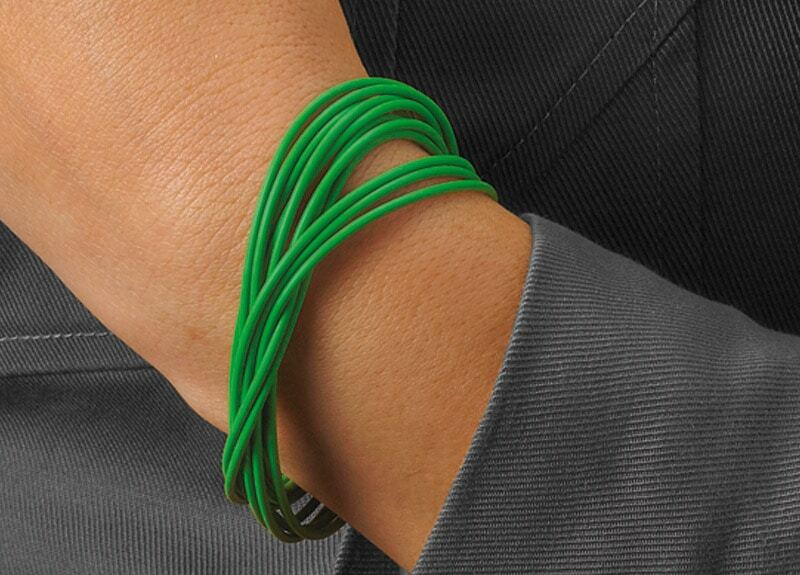 The “O-RINGs” of the packaging are made of natural rubber and can be re-used as collectable bracelets. With customizable snap button fasteners, cotton stitching available in various colors. Size: 19×19 cm (7.48×7.48 in). The steel ring is also available in various colors. Customizable snap button fasteners. Size: 3.5×7 cm (1.38×2.76 in). 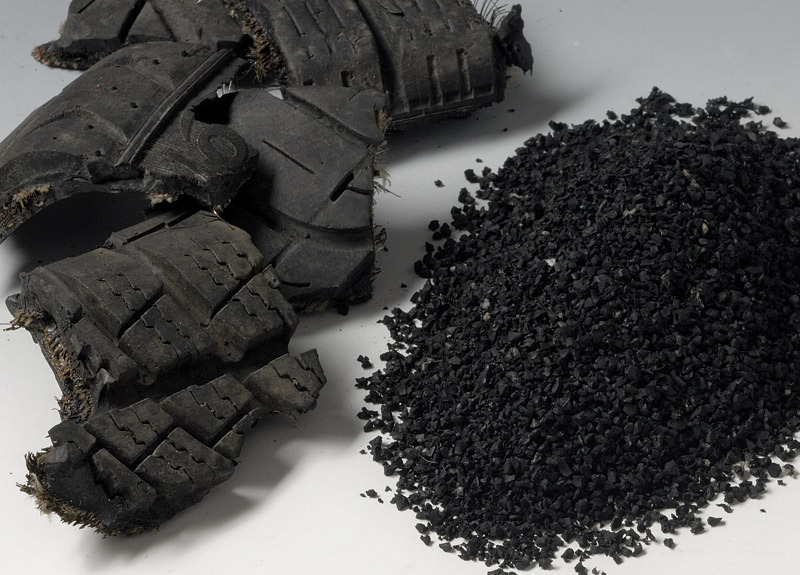 An unusual secondary raw material that is strong and soft at the same time, recycled inner tubes are available in large quantities, as they come from all vehicles on our roads, from bikes to tractors. It is light and as such can be sewn by hand or machine, like a fabric. 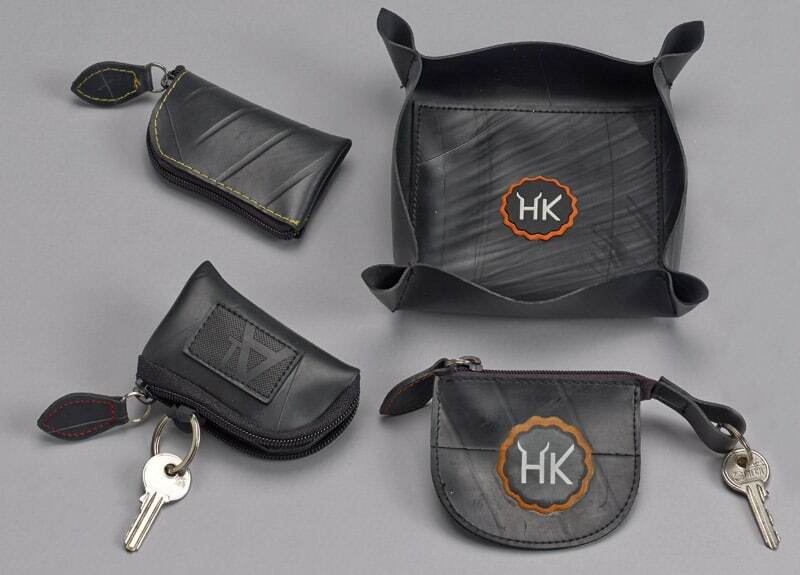 It can be customized by laser printing on fabric or inner tube labels. Zipper closure and ring for keys. Size: 6×10.5×1 cm (2.36×4.13×0.39 in). Perfect for keeping your desk tidy. Size: 13x13x3 cm (5.12×5.12×1.18 in). Mark Lai, Hell’s Kitchen designer, and his inner tire tubes. Pencil case with Velcro fastener. 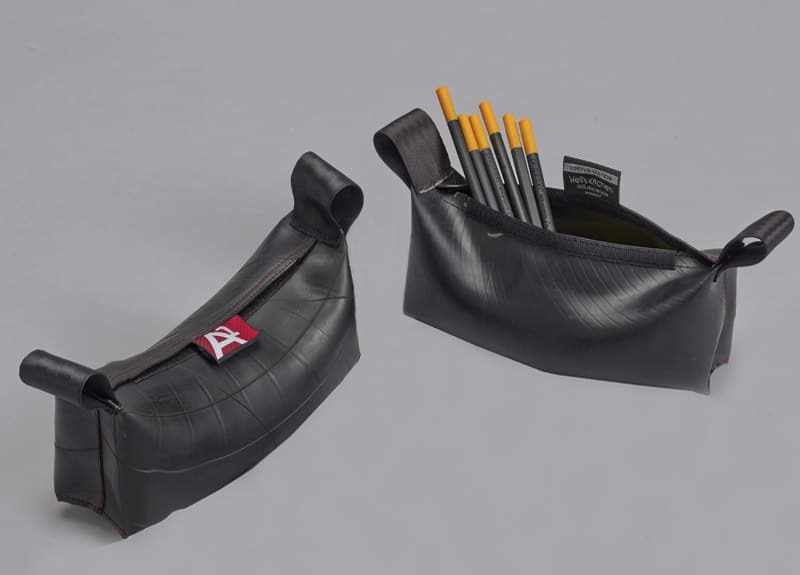 Bag made entirely of recycled inner tube. Zipper fastener, with an inside pocket. All the seams are made of cotton thread. Size: 45×21,5×23,5 cm (17,71×8,46×9,25 in). 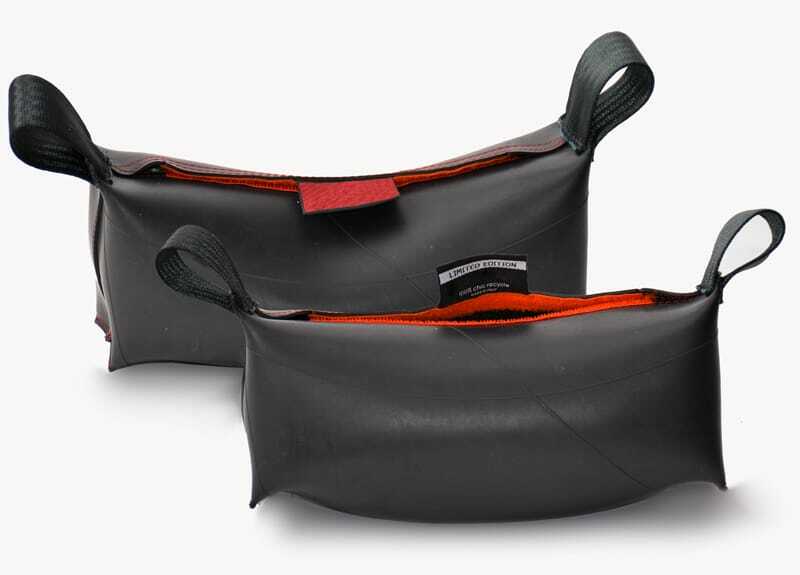 A practical and equipped bag made from recycled inner tubes with a Velcro fastener. The bag is fully lined with a vintage T-shirt. The adjustable shoulder strap is a recycled car seat belt. Size: 30x30x10 cm (11,81×11,81×3,93 in). 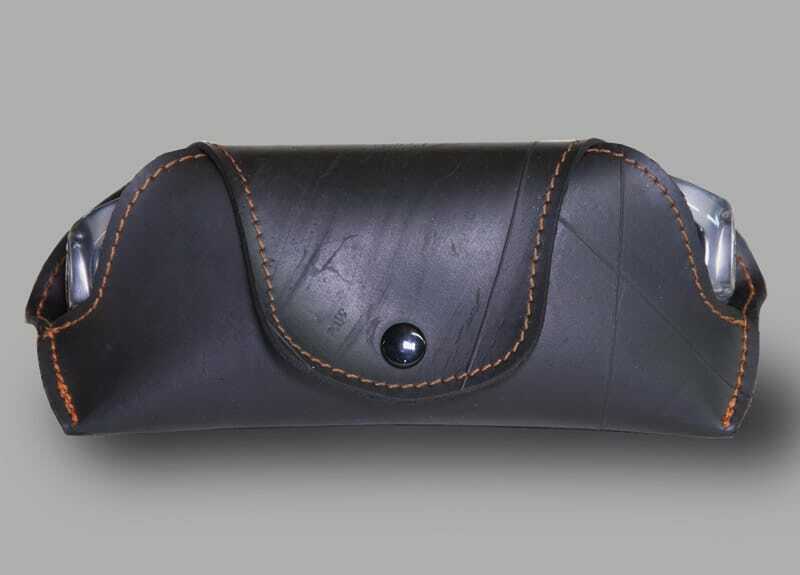 iPad case made from recycled inner tubes. Envelope-shaped with Velcro fastener on upper edge. Protects your iPad from dust and scratches. 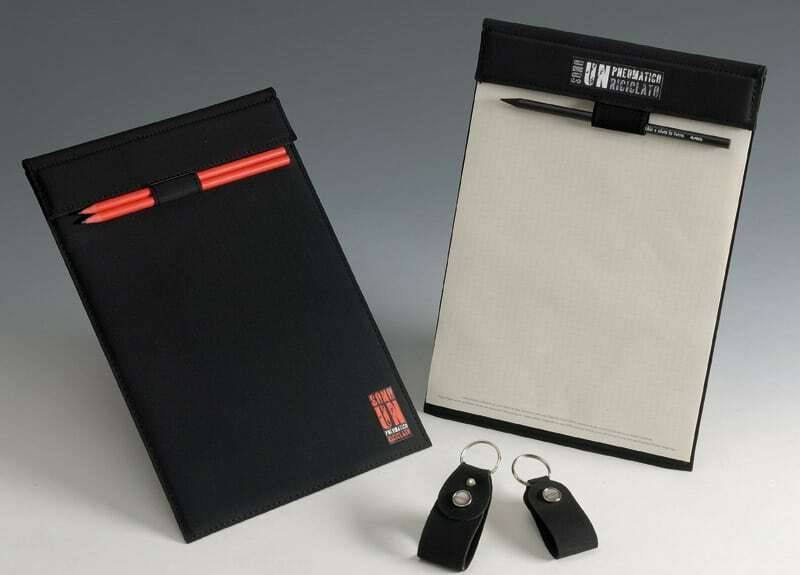 The case is fully lined with a vintage T-shirt and has a zip pocket on the back to hold small items such as USB flash drives and power cables. 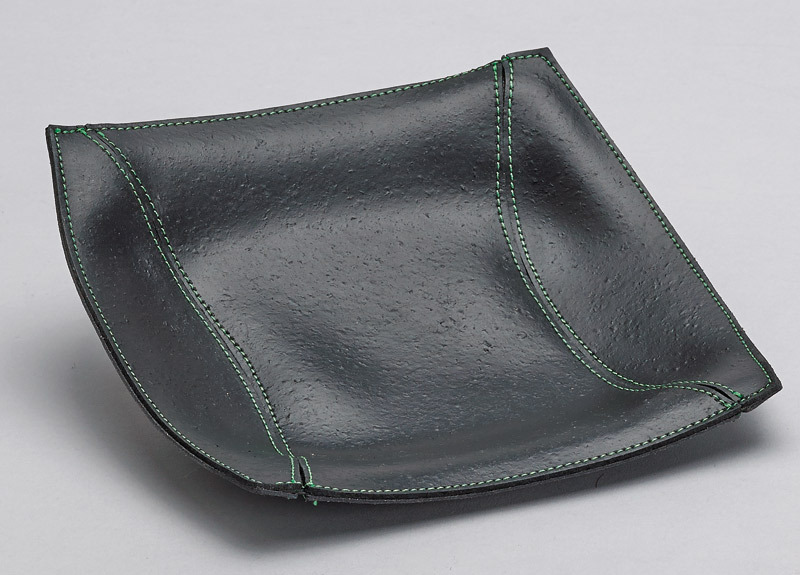 Size: 24x19x3 cm (9,44×7,48×0,12 in). 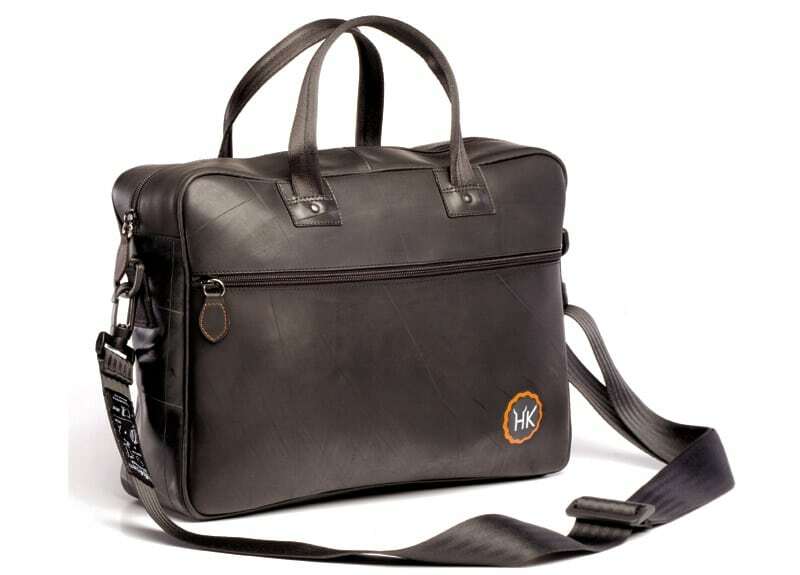 Carry case lined with a shirt, with an inside pocket, an outside pocket, a removable shoulder strap and a central zip. Size 38x28x12 cm (14.96×11.02×4.72 in). 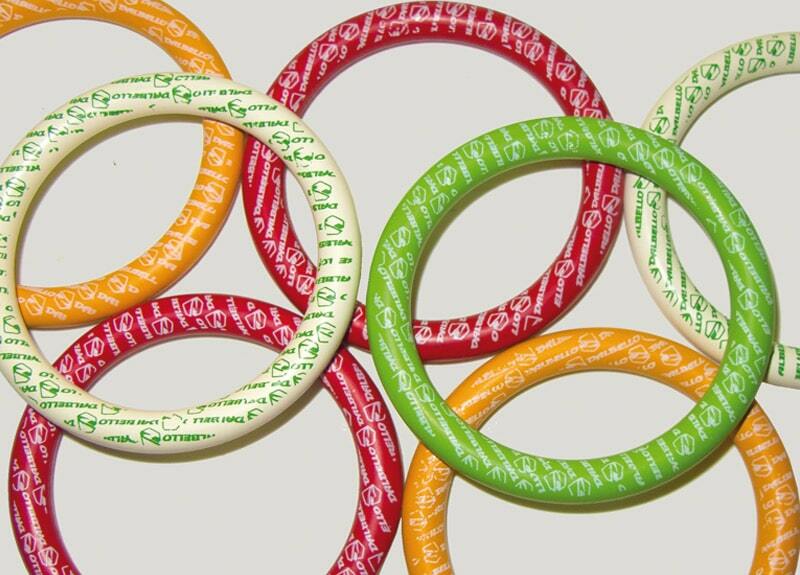 The “O-RINGs” are made in Italy, with natural rubber, extracted from the plant, and coloured with natural ingredients. 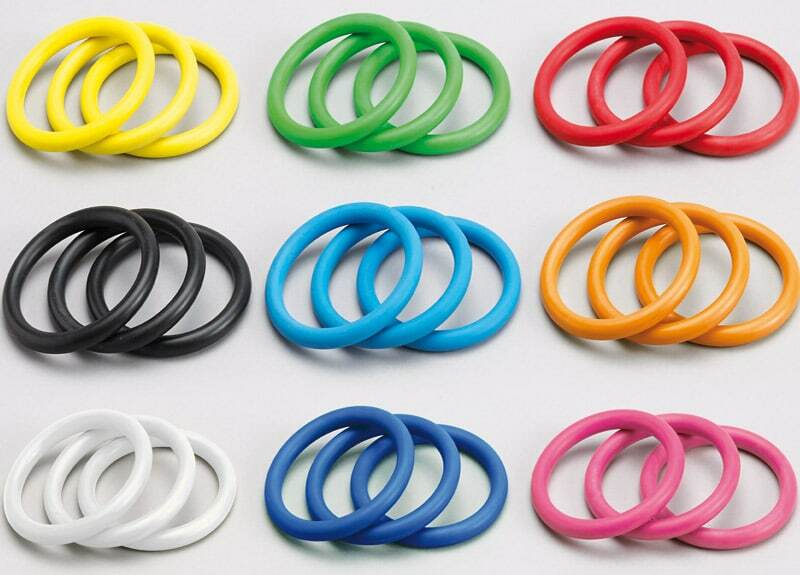 The “O-RINGs” – hydraulic seals, originally just black – “for the first time” are re-interpreted by Alisea in new colours and also transformed into multi-coloured bracelets to wear. The most famous type of natural rubber is elastic rubber, which returns to its original shape after being bent. It is made from the latex of various plants of which the best known is the Hevea Brasiliensis, a rubber tree that is native to the Amazon and grows to be about 30 meters high. 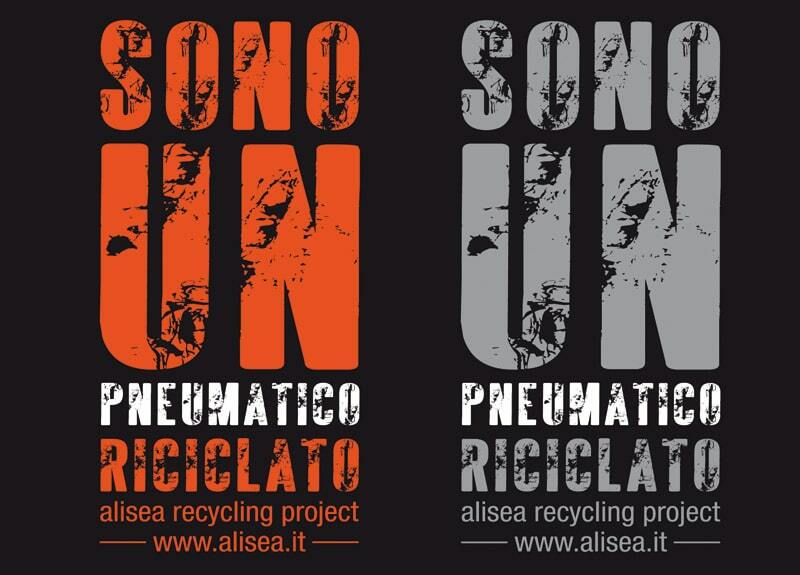 Alisea collaborates with the research and development department of a manufacturer of technical rubber for gas applications (for civil, industrial and automotive use). 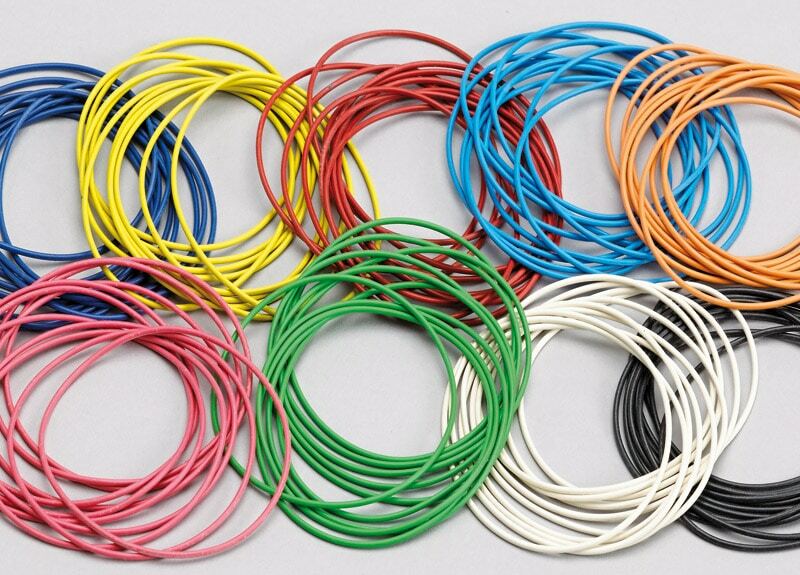 This has allowed us to create the “O-RINGs” made of soft rubber using 90% natural ingredients, including the dyes. Diameter 60 mm (2.36 in), chord 1.5 mm (0.6 in). 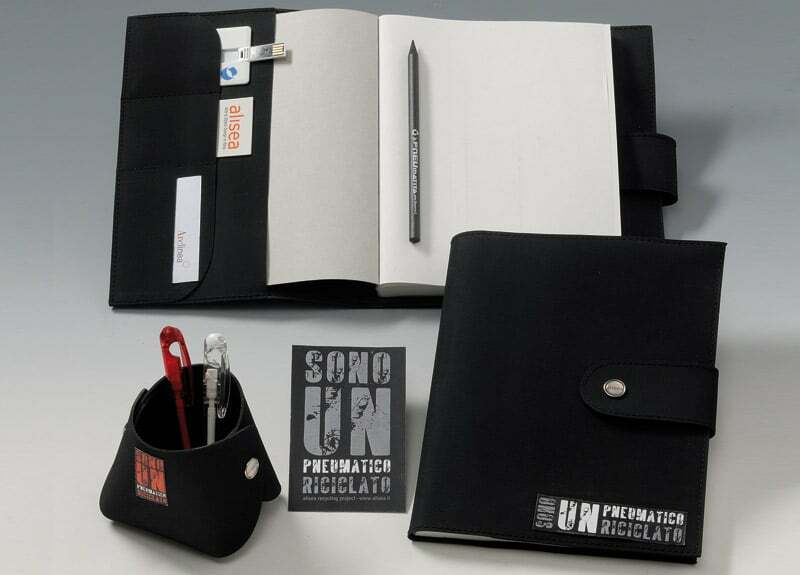 Entirely produced in Italy in accordance with the regulations, they are available in 10 different colors plus black. Amber (no added colorants), Natural Black, Purple Bordeaux, Pearl white, Magenta, Yellow Sulfur, Light Blue, Gentian Blue, Yellow Green, Pastel Orange, Traffic Red. 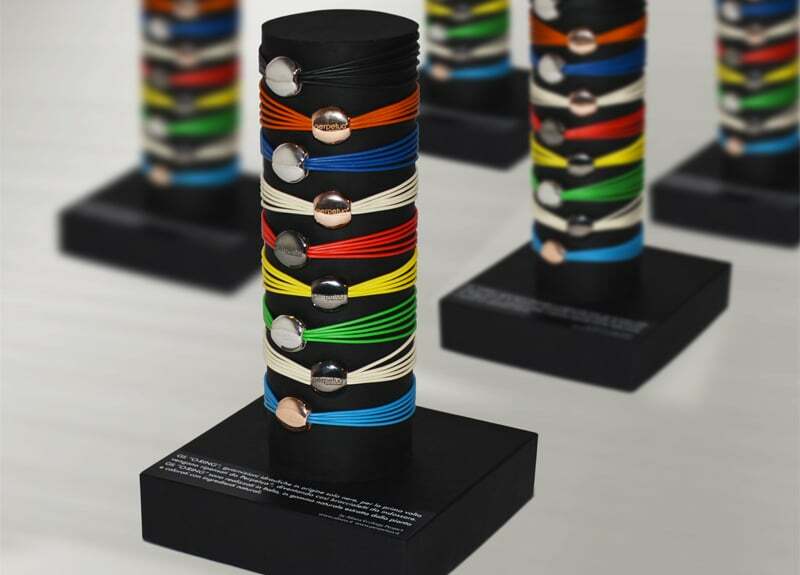 The closure system designed and manufactured in Italy by Alisea, allows the interchangeability of the coloured “O-RING” to make sure that everyone can build and decide the colours of their bracelet. 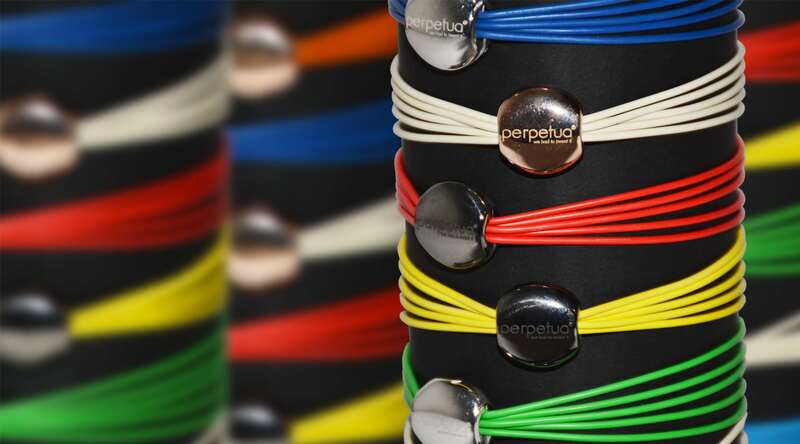 This system can allow the creation of “TAILORED” bracelets that reflect one company’s colours, and can be customized with laser engraving of the customer’s logo. The “O-RINGs” in natural rubber can be used to close diaries. 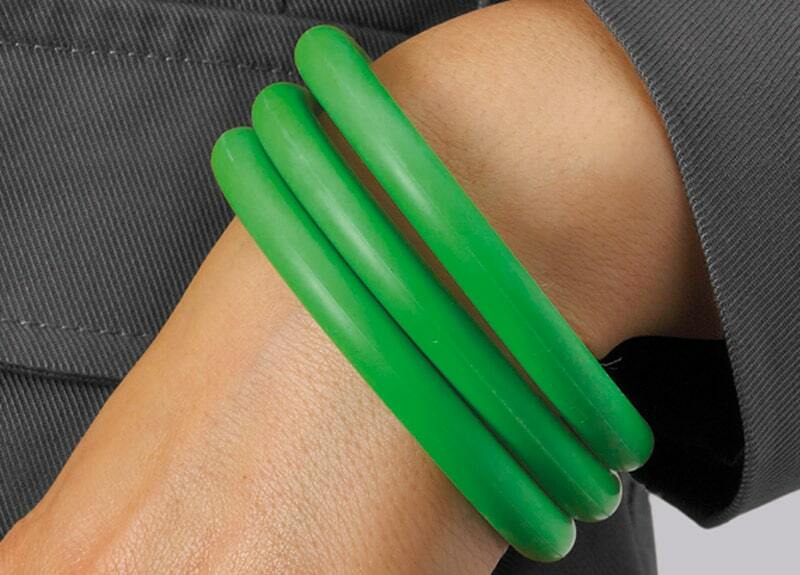 The “O-RING” made of natural rubber extracted from the plant are coloured with ingredients of mineral and natural origin. Example of silk screen printing customization. Diameter 60 mm (2.36 in), Chord 8.5 mm (0.33 in).